Here you will find a huge range of Poultry houses, duck houses, chicken coops, hen houses, chicken arks and runs made in the UK. Fox proof and robustly built from treated timber. Our floating duck houses, duck houses for the garden, chicken coops and runs are all manufactured to extremely high standards. Manufactured from treated timber from sustainable sources and the runs are made from heavy grade galvanised mesh and we aim to make them as fox proof as possible. Included in our range of British Made hen houses are poultry housing manufactured by Littleacre, Jim Vyse Arks, Rowlinsons chicken houses as well as our own Buttercup Farm Hen houses and our All Cooped Up Enclosures and runs. We sell an extensive range of different sizes and styles of very good quality chicken houses and runs. Take a look at our best-selling Tall Poultry Shed with nestboxes and large adjoining run and our chicken and bantam arks, ideal hen houses for back garden chicken keeping. Don't miss our popular chicken pod hen coop and Shepherd's hut hen house, great if you are looking for an attractive coop as well as a practical design. BESPOKE SERVICE – Tailor-made to measure to your requirements. If you are looking for a specific size, shape or configuration. 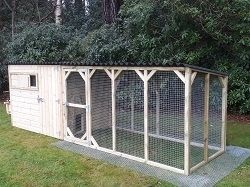 Our aviary panels are also available to make up your own chicken run, duck run or aviary to your own dimensions and specifications, so if you have any specific requirements or are looking for a bespoke design. If you need help in choosing the right hen house, please call us for a chat as we are able to offer free advice on poultry keeping and will be able to guide you to a suitable coop to suit your chickens.